Pal Benko was in Amiens, France on Jul 15, 1928 but grew up in Budapest, Hungary. Benko learned chess from his father in 1938, at the age of 10. His first book was a collection of Capablanca's chess games. In June 1945, in his first chess tournament (played in Budapest) that had 10 masters and 7 candidate masters, Benko took first place and became a master himself at the age of 16. In his next tournament, a small Masters’ tournament in Szeged, he took the first place prize, winning some flour and bacon. When he played in the Hungarian Championship in 1946, the prizes were also food rather than money. After World War II, Benko went to a university in Hungary and majored in economics while working in a textile company. His first international competition was a Vienna-Budapest team match, held in Vienna, Austria in the American Zone. He participated in his first international tournament in Budapest in the spring of 1948. He won the Hungarian national championship in 1948 at the age of 20. In 1950, he took 3rd place. In 1951, he took 6th place. In 1954, he took 2nd place. In 1955, he took 3rd place. In 1950, Benko decided to make chess a career, left school and became a bookkeeper. He was awarded the International Master title in 1950, the first year that FIDE created the title. In 1952, he tried to defect to the West while in East Berlin, but got caught and was sent to a concentration camp for a year and a half. The Hungarian Secret Police once suspected he was a spy because of his coded letters. The coded letters were correspondence chess games and the code was chess notation. He was permitted to play first board on Hungary's team in the 1957 World Student Team Championship (Student Olympiad) in Reykjavik, Iceland where he defected to the U.S. In July 1957, he walked into the American embassy in Reykjavik and asked for asylum. He came to New York on October 17, 1957. He worked on Wall Street for several years, then sold mutual funds and real estate as an independent agent. He didn't return to Hungary until 1964 on a visit. He became a Grandmaster in 1958 after tying for 3rd-4th in the Portoroz, Yugoslavia Interzonal (defeating Bobby Fischer) and qualifying for the Bled/Zagreb/Belgrade Candidates tournament. At the Candidates tournament, he took last place, won by Mikhail Tal. In 1959, he took 4th place in the U.S. chess championship. In 1960, he took 8th place. In 1961, he took 4th place. In 1962, he took 9th place. In 1963, he took 3rd place. In 1965, he took 7th place. In 1966/67, he took 3rd place. In 1968, he took 4th place. In 1969, he took 3rd place. In 1972, he took 5th place. In 1973, he took 5th place. In 1974, he took 2nd place. In 1975, he took 14th place. In 19789, he took 9th place. 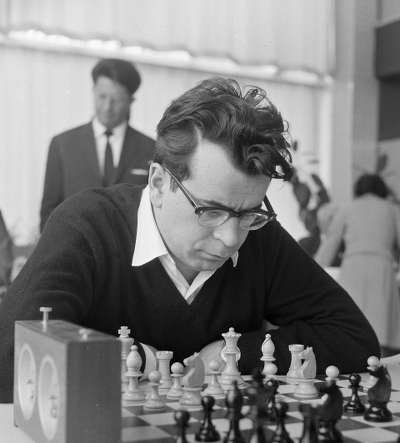 In 1962, Benko shared 6th place at the Stockholm Interzonal and qualified for the Curacao Candidates, where he took 6th place. It was in Curacao that Benko hit Fischer after Bobby insulted him and continued to goad him. The fight was over Benko asking for Bisguier to help him analyze an adjourned game when Fischer also need Bisguier to act as Fischer's "second." In 1963, Benko quit his job and became the only professional chessplayer (other than Fischer) in the United States. In 1964, he won the Canadian Open Chess Championship. In 1965 he was the first American Open Champion. In 1966, Benko won the National Open. He won it again in 1968 and tied for 1st in 1975. In 1967, Benko first played the Benko Gambit (1.d4 Nf6 2.c4 c5 3.d5 b5) in international competition against Vukic in Sarajevo. He had played it earlier in some U.S. Swiss events. In 1968, he married Gizella in Budapest,Hungary. His daughter Palma was born in 1969, and his son David was born in 1971. In 1970 he yielded his Interzonal place at Palma de Mallorca to Bobby Fischer, who went on to become World Champion. In 1973, his peak Elo (FIDE) rating was 2530. He has won or tied for first place in eight U.S. Open tournaments, a record. He won or tied in 1961, 1964, 1965, 1966, 1967, 1969, 1974, and 1975. He represented the USA in six chess Olympiads in a row. In 1992, Benko played in his last chess tournament, the World Senior Championship in Bad Worishofen, Germany. In 1993, he was inducted in the U.S. Chess Hall of Fame. In 1995, he was awarded the Problem Composing International Master title. In 2003, he revised and updated Reuben Fine's Basic Chess Endings. His book, Pal Benko My Life, Games and Compositions won the 2004 British Chess Federation Book of the Year.